Hanging out with friends, travelling to new and exotic places, discovering the pleasant sites scattered across the planet has been a fascinating and much followed passion among people since long back. Ages ago, travelling to a foreign land meant an additional hassle of hiring a guide or the fear of getting lost in its valleys and taverns. A lame guide may also take advantage of your inexperience and lead you to a trap. In this age of technology, Facearound, an app designed by Business Competence comes to your rescue. The app provides free service i.e. it can be easily downloaded from the app store free of cost. Resembling the features of Google maps, it lets you explore everything around you. It serves as an encyclopedia for the sites and venues, you want to visit. Besides serving as a tourist guide, it also provides information about the nearby malls, restaurants, gift shops and others. Geolocalize yourself, to discover the pros and cons of the things around you, based on the reviews and opinions of your friend, and other users. Suggest your friends about the great experiences you had or learn about their opinions on places and venues. If you want to buy a bouquet for your loved one at 8pm, just search on Facearound app. From cobbler to a hairstylist, a sari showroom to a motor shop, it provides you extensive details including the discounts, sales and offers provided by them. 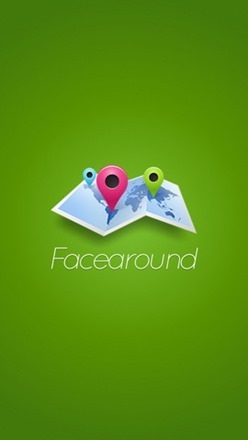 A fusion of navigation and social networking, Facearound lets you be familiar with your surroundings, with the help of your friends. To benefit from the features of this app, first you have to permit it to integrate itself with your Facebook account. You will find yourself centered on the map and the whole world revolving about you. Efficiency of the interface is such that you just need to type in your choice in the search bar which leads you to a variety of options. 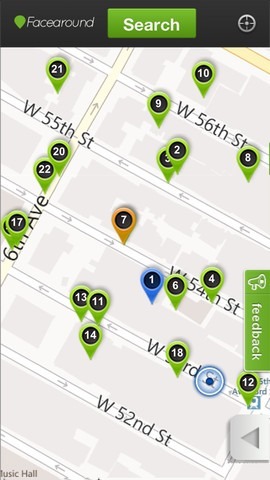 You are presented with a map displaying recommended places around you, in different shades of colors. When you tap on one of these places you get detailed information on them, plus reviews and opinions of the previous visitors. The search is further narrowed down when you give weightage to the opinions of your peers. Sorting by deals, votes or alphabetically is another one of the special features of this app. 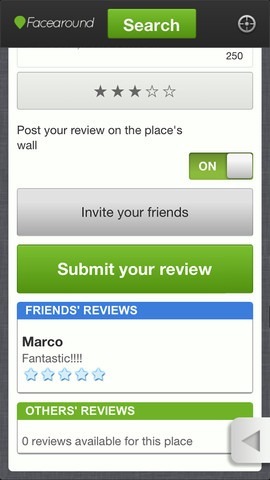 You can also contribute to the ratings by putting in your opinions and helping your friends in a similar way. In addition, it provides a unique feature of the different modes in which it can be viewed, i.e Standard, Satellite and Bird-Eye modes, similar to various distinguished map services. It is user friendly and provides an efficient user interface. The graphics looks nice, responds quickly despite its connectivity to the internet. Though it proves to be a user-friendly app, it is also not without its disadvantages. When you are presented with the map with different places highlighted on it, and you tap on one of these, a little modal window opens. But, it gets a little messy when you are unable to close the open window to move on to the other search option. Facearound requires a storage memory of 18.8 MB and an iOS of 4.3 or later. Available for free, it supports languages: – English, German, Spanish and Northern Sami. Other than the minor defects, it is one of the best among its categories.